There are many posts to be written here about the former pubs of London, and in the fullness of time (which has already been very accommodating) I hope to write about the many uses to which they have been put, including posts about former breweries and their tied pubs, and maybe a few more about notable districts (I’ve already done a post touching on Soho). 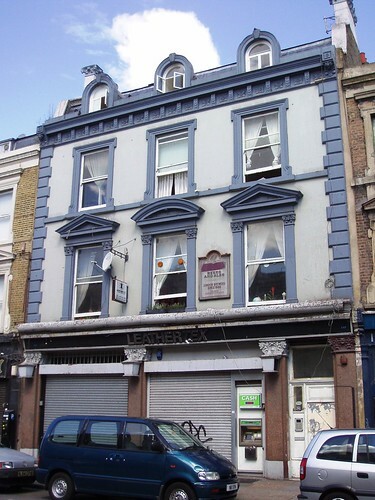 First though, I want to talk about how one may spot former public houses, and some reasons they came to be closed. Figure 84. 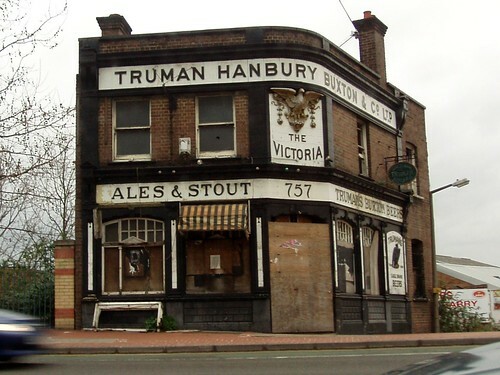 The Victoria (Charlton SE7), now closed. In London, as in most large conurbations, we are constantly surrounded by reminders of the past. But perhaps more than many world cities, London has been built and rebuilt countless times with (until recently) a fairly cavalier regard to the physical presence of the past. Ancient buildings and grand monuments alike have been demolished in the name of progress, and against this pubs have never really stood a chance. As a small example casting a particularly nostalgic shadow when we see old photos of them, coaching inns stretching back centuries and mentioned (or used) by the greatest of authors and historical figures, were swept away by past rebuilding (the last around the turn of the 20th century).1 Even now, few pubs are listed historical buildings, and they continue to disappear as it suits developers (The Wenlock Arms [Hoxton N1] being only the most recent of such battles). The closure and repurposing of pubs is an outcome of many different social trends over time: changes in population distribution; changes to work/living practices; the decline in social drinking (aspects of which are linked to law changes); the erosion of neighbourhood cohesion (changes to work practices, increase in public transport options); the explosion of property prices; the stranglehold exercised by PubCos; and others. I shall write below about just three such areas, before moving on to spotting former pubs. Long time, no update: I’ll bet you thought I’d gone away. Well, it’s the New Year and I’ve been fairly lax about updating here, so I’m thinking of adding more short blog-like posts to fill the downtime between me getting around to writing longer pieces. My compulsion to ensure I have a photo of all the relevant pubs, rather delays me actually writing anything. Something to get us going again are buildings in the centre of the West End which you’d be forgiven for not realising had ever been pubs in the first place. Probably the original ground level entrances have been completely remodelled, or you’ve just been in such a rush to get out of the crowds you hadn’t noticed the buildings themselves, some of which have giveaway clues (for example, the name of pub in permanent architectural lettering1), many of which don’t. In fact, most of these buildings I hadn’t myself noticed until I’d done some research and had compared the addresses. Figure 37. 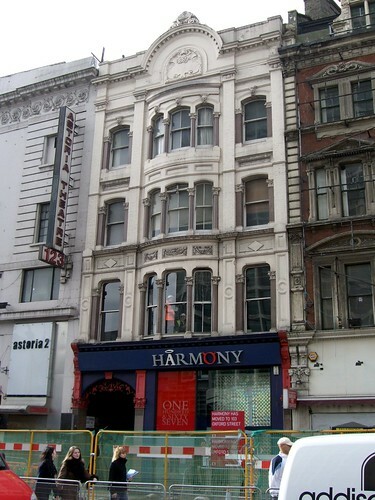 The Excelsior (Soho WC2), now demolished.